Is Isabel dos Santos' Sacking The First of Many Lourenço Moves? Just think for a minute. In a two-year span, a father gave his daughter, among several contracts, four that were worth over US $22 billion. The father is then President José Eduardo dos Santos, and the daughter is Isabel, Africa's richest woman. These were the golden days of the presidential family's capture of Angola. Period. In the past month, with a stroke of a pen, General João Lourenço has annulled the four egregious contracts. The former "princess" is crying foul, and is threatening to sue the Angolan state however, the state is calling out her bluff. Her fortune is about to tumble like a house of cards, just as her father's power fell flat once he left office after 38 years. Through her father's presidential decrees, Isabel built her fortune. Now, ironically, the man her father personally chose to replace him is first and foremost taking away the family's fortunes that are tied with the state, thus recapturing it from their thieving hands. Let us just review these four contracts. In 2015, Dos Santos appointed his daughter to lead the Luanda Metropolitan Master Plan, budgeted at US $15 billion, to revamp the capital city. Therefore, her shell company, Urbinvest, had the monopoly of the project. Back in the day, there was no one smarter and more competent in the country than Isabel dos Santos. Public tender, and transparency became silly anti-development jargon even for foreign investors whose main mission had become to partner with the power gatekeepers. There was an international spin that cast Isabel dos Santos as a positive story for Africa, as she was hailed the most successful businesswoman on the continent. And the reality of her looting of the country under her kleptocratic father was downplayed or outright ignored. That same year, through Presidential Order 58/15, Dos Santos also awarded Isabel dos Santos the construction of the Caculo-Cabaça dam and hydropower station for US $4.5 billion. The powerful China Gezhouba Group Corporation (CGGC) had initially entered into a 50/50 consortium with Isabel's shell company, Niara Holding, to win the contract and build the dam. The Industrial Commercial Bank of China (ICBC) secured the financing for Angolan oil in return. A year later, inexplicably Dos Santos signed another order adding an extra US $500 million for the daughter's joint venture, thus totaling US $5 billion. Somewhat generous, she lowered her share in the joint-venture to 40%. What was the rationale for this dam? It will be built 19 kilometers away from the recently built dam and hydropower station of Laúca, which cost over US $4 billion. It will be the fourth dam and hydropower station built along the same River Kwanza in a stretch of some 130 kilometers. Another one Isabel dos Santos' contracts slashed by President Lourenço is the planned 7 km coastal road from Luanda's city center to the Corimba neighborhood, which would include an area of 400 hectares reclaimed from the sea. This is a contract worth over US $700 million, to be financed by the International and Commercial Bank of China and the Chinese Eximbank. Her company Urbinvest S.A had the monopoly of the project, which would include 700 hectares "of high density mixed-use residential and commercial development". Last August, while everyone was busy with the elections, Dos Santos was looting to the last minute to leave as much business ventures as possible to his family. He signed the Presidential Decree 207/17 that granted Isabel dos Santos' Atlantic Ventures S.A the contract to build and have the exclusive management rights to the port for 30 years (plus 15). Unsurprisingly, the state provided the sovereign guarantee for this shell company, which had been fully registered the month before, to secure US $1.5 billion in funding for the operation. Furthermore, the state Port Authority (Porto de Luanda) was instructed to buy 40% shares of the newly established company for an undisclosed amount. Now, Isabel dos Santos wants to sue the state for an alleged breach of contract. On June 20, in a scathing rebuttal of her statement, the Ministry of Transport called out her father's abuse of power and her lies. The legal argument used by Isabel dos Santos' enterprise is quite baffling: "The law applicable for this project is the Law on the Port Concessions and it was correctly applied by the former government in this case. The Law on Public Contracts - which could have demanded the holding of a public tender - does not apply to contracts for Port Concessions, as the current government underscores now." According to the Ministry of Transport's press release, José Eduardo dos Santos awarded the contract without any tender and "without observing any formalisms". Furthermore, the ministry called out Isabel dos Santos' lie that "Atlantic Ventures was set up as a partnership including national and international investors who are leaders in the port industry". It also made clear that the state would cough up the investment. The government revealed the names fronting for Isabel dos Santos as shareholders of Atlantic Ventures S.A. Her cousin and personal lawyer, Fidel Kiluanje Araújo, holds 99% of the share, while four other sidekicks equally split the remaining one percent. The government says that it is public knowledge that none of the names mentioned have any background experience to undertake such a major project, and that neither Isabel dos Santos nor any foreign investor is part of the said company. Legal analyst Rui Verde has studied the laws applicable to the contract and simply writes that Atlantic Ventures S.A legal argument does not fly: "There is no legal norm that makes an exception of public tender for a port concession contract. Thus, it must be subjected to the normal procedures for administrative contracts. That is the Law on Public Contracts (Law 9/16) [of 2016]." 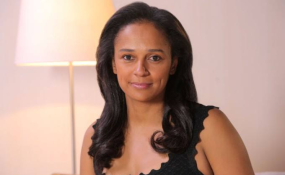 Isabel dos Santos' insatiable greed to devour Angola's political economy was only matched by her own arrogance that the country was hers for the taking. In 2016, when her father appointed her to head the National Oil Company Sonangol, Isabel dos Santos had it all in her pocket. She finally had the oil sector at the tip of her fingers, just as she had all the diamonds (Angola is the fifth largest producer in the world). Through the usual presidential power, the then first daughter's companies had the exclusive rights to sell Angolan diamonds abroad (in partnership with the state on paper). However, Lourenço's broom swept her out of Sonangol. The blunt official justification to push her out of the diamond selling venture said it all: Her partnership with the state only represented losses for the latter and gains for her. It was broad daylight robbery. She also threatened to sue the state diamond company Sodiam for cutting her loose. But it is her brazen tenure in Sonangol and her intersected business interests with the State giant that underscores her rise and fall. They are all at risk of being severed as well, and one of them represents the core of her fortune. That is the telecom company UNITEL, in which both Sonangol and Isabel dos Santos have each 25% stakes. Sonangol was the initial investor in UNITEL, and there is no record that shows that she ever paid for her shares. In the coming months, the Paris based International Court of Arbitration will decide on a US $3.5 billion lawsuit against her mainly. Portugal Telecom Ventures (taken over by the Brazilian telecom giant Oi) holds 25% of UNITEL and lodged the complaint to reclaim unpaid dues worth US $600 million. The company is also suing for Isabel dos Santos' self-serving management of the company's revenues. During her daddy's reign, Isabel dos Santos used UNITEL as her piggy bank. Between 2012 and 2013, UNITEL lent US $465 million to UNITEL International Holdings (100% owned by Isabel dos Santos) without the shareholders consent, for her business shopping sprees in Portugal. She simultaneously signed the contracts as the representative of the lender (UNITEL) and debtor (UNITEL International Holding), and set a 10 years maturity and 1% interest rate to pay back the debt. Notwithstanding, another Isabel's 100% owned company, Tokeyna, bought UNITEL's credit to her. The accounting verified by Maka Angola shows that, the telecom company lost in the process US $315 million with such shuffling. However, in 2014, the same Isabel dos Santos forfeited to receive her US $322 million dividend, which was converted into a loan for UNITEL with a 12% interest rate. Consequently, as the accounts demonstrate, UNITEL lost US $315 million with the loan it provided to Isabel dos Santos, and she made a clean US $35 million profit by lending to UNITEL a year after. Last year, she withdrew US $458 million in dividends and debts from the telecom, including US $265 million for 2017. In essence, she started the process of leaving "no money behind". It is rumored that Sonangol is set to push her out of UNITEL by demanding a payback for all her wrongdoings. That would mean her fall from one of the main Angolan private banks, Banco Fomento de Angola (BFA), in which the telecom has a 51% stake. Isabel dos Santos controls it, and sits on the board as its vice-president. Her personal lawyer, Jorge Brito Pereira (a Portuguese citizen) is the chairman of the bank's General Assembly, while her fortune manager, Mário Leite da Silva (another Portuguese citizen) is the chairman of the board. Without the Angolan cash cows, Isabel's empire in Portugal, where she parked much of her international investments, will also become unsustainable. They depend on the former colony's easy pickings.